Index on Censorship magazine was awarded the Amnesty International Media Award for best periodical at a ceremony in London on Tuesday. The award was given for a series of articles from the issue ‘How Free is the Russian Media?’. Presenting the award to Index’s Jo Glanville, Private Eye editor Ian Hislop said that the articles, by Fatima Tlisova, Sergei Bachinin and Alexei Simonov represented ‘brave, impassioned journalism as stunning defences of principle’. 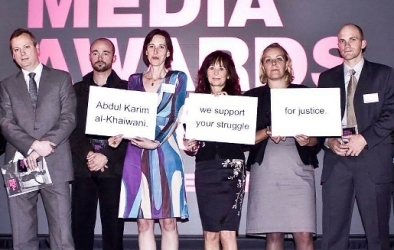 National Union of Journalists Secretary-General Jeremy Dear described the issue as ‘a brilliant piece of work’.